As soon as I got off the bus and saw the strange parade, I knew I was in the right place: A stray dog trotted down the street after three boys leading a small horse behind a pickup truck filled with musicians, one beating a large, flat drum nestled between his legs. In front of them all strode two lumbering camels frothing at the mouth, the bells lashed to their saddles clanking like particularly tuneless wind chimes. 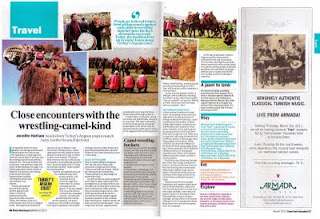 Read the rest of my article about camel wrestling in the March 2011 issue of Time Out Istanbul: jpg | pdf. UPDATE: Time Out Istanbul has finally put this story up on their website: "Close Encounters With the Wrestling-Camel-Kind."